Today it’s called Sheppard’s Pie but it was originally called Cottage Pie. Sheppard’s Pie referred to the version made with mutton. Cottage Pie was first made by blue collar workers who used their leftovers like roast beef (or mutton – hence the ‘Sheppard’s Pie’) and potatoes to make a quick and hearty meal. Interestingly, it’s known as ‘Pâté Chinois’ in Quebec, Canada (French). It was served to the mostly Chinese rail workers during the 19th century. It was easy to prepare and tasted so good that the native Quebecer workers began making the recipe at home. 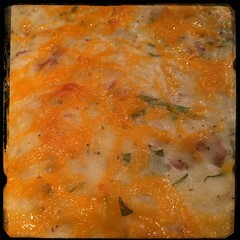 2. add butter and sour cream, then mash! 3. Add freshly chopped parsley, salt and pepper with some potato water (about 1/4 cup or so). 1. Sauté onions, garlic and hot peppers in 2-3 tbsp olive oil. 2. When the onions begin to show transparency and the garlic softens add the diced carrots. 3. When the carrots soften, add the ground beef. 4. When the beef sufficiently cooks add the diced peppers. 5. When the peppers soften, add the mushrooms and let simmer for 5-10 minutes. 6. Once the ground beef mixture has been simmering for 5-10 minutes, add the butter. 7. When the butter melts, add 1/4 cup Worcestershire Sauce. 8. Let simmer for 5-10 minutes before adding the oregano (preferably fresh but dried will do), salt and pepper. 9. Mix in the peas and corn, let simmer for 10-15 minutes. 10. Add the the parsley, mix well. 11. Finally, add a bit of beef stock, a stout like Guinness or potato water and let simmer for 10 minutes or so. 1. Place meat in baking pan and add a bit of beef stock, a stout like Guinness or potato water. 3. Add the shredded cheddar cheese on top. 4. Pre-heat oven 375F and bake for 30-45 minutes or until cheese begins to brown.